I used to love eating bottled sardines because they're good and so easy to prepare. 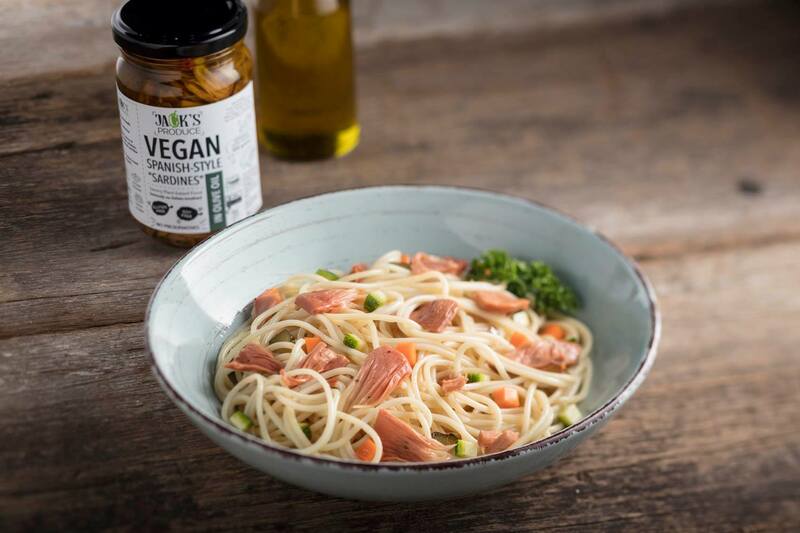 I remember, whenever I have last minute guests at home, I prepare my Sardines Pasta because it's always available in my pantry and it's so easy to cook. It's basically just - In a pan, sauté lots of garlic in olive oil, add your bottled sardines and add your cooked pasta. Season with salt and pepper. But, now, Jack's Produce Vegan Sardines is the perfect replacement. Much better and healthier! Since I became Vegan, I missed eating sardines. Then, I discovered Jack's Produce at The Vegan Grocer and at Good Food Sundays at Mandala Park. I later on found out that the owner of Jack's Produce is my fellow Assumptionista, my classmate, Ferch Santos-Reynoso. Wow! Small world! 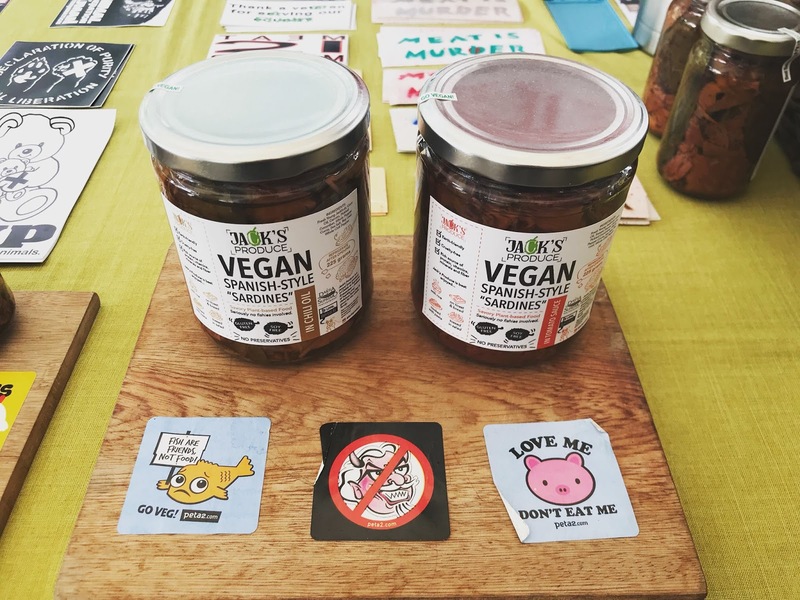 First time I tried their Vegan sardines, I loved it instantly! Finally, I was able to eat again my favorite sardines but this time, no animals died and it's cruelty free. For me, it tastes even better than fish. The seasoning and taste is exactly the same as the real Spanish-Style Sardines. 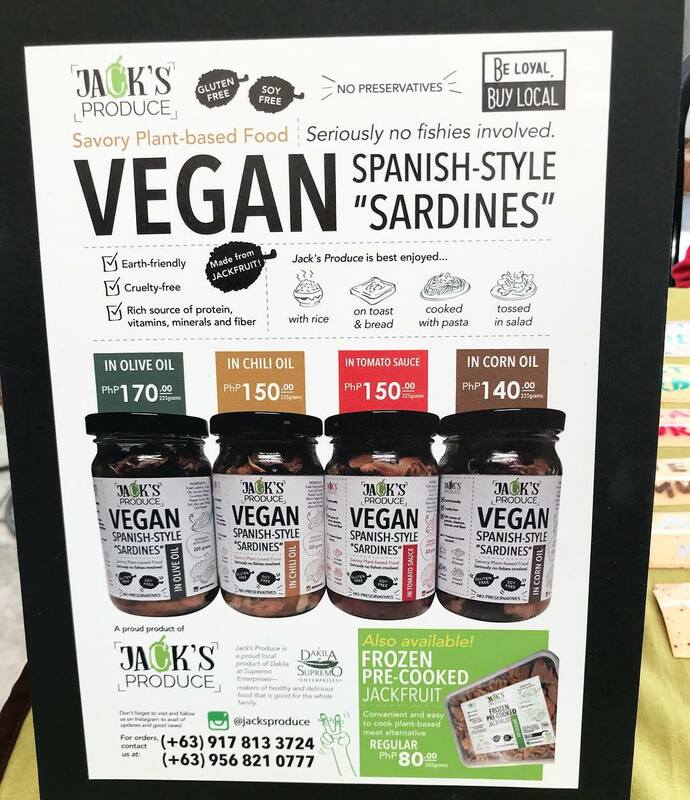 Jack's Produce Vegan Sardines is whole food, plant based, gluten free and soy free. So, now, I always have stocks of Jack's Produce at home. Whenever it's a lazy day to cook, I just open a bottle and serve it with my favorite vegetables on the side and steaming-hot white rice. Best combination for me. 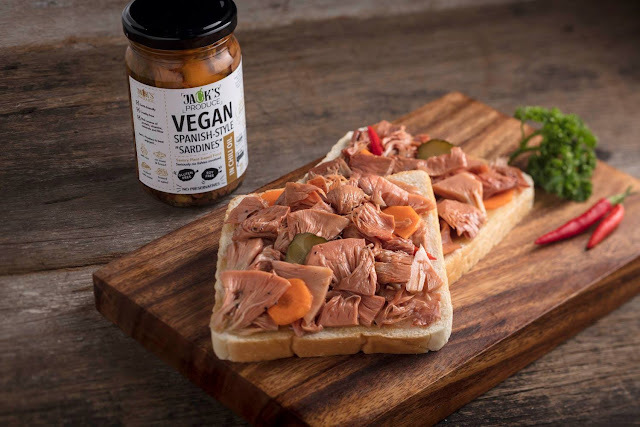 You can pair your Vegan Sardines with Vegan bread and Vegan Mayonnaise. Season with Himalayan Pink Salt and freshly ground black pepper. Add veggies like lettuce, sliced tomatoes, sliced bell pepper and sliced white onions. Serve with hot sauce. Yummy! This is my favorite! So easy to prepare... I served this for lunch the other day. Just open a bottle of your favorite flavor of Jack's Produce and slice some tomatoes. You can also serve it with sliced yellow, green and red bell pepper on the side. My favorite sawsawan for my Vegan Sardines is soy sauce with calamansi... But you don't really need one. It's good as is. We most of the time use brown rice but for my Vegan Sardines, I love my white rice with it! When I asked Ferch what made her decide to go Vegan, she said, "It was after my kids (6yo and 8yo that time) along with my husband saw a short video clip, Farm to Fridge, which was shown at VegFest Pilipinas 2016. Farm to Fridge is a 10 min documentary that shows the reality on animal slaughter, and by the end of the video, my youngest son was crying and the eldest was shocked about what they just saw. That very moment, they swore off eating animal food and when they told me of their decision, I obliged to support the cause of their good, compassionate hearts. 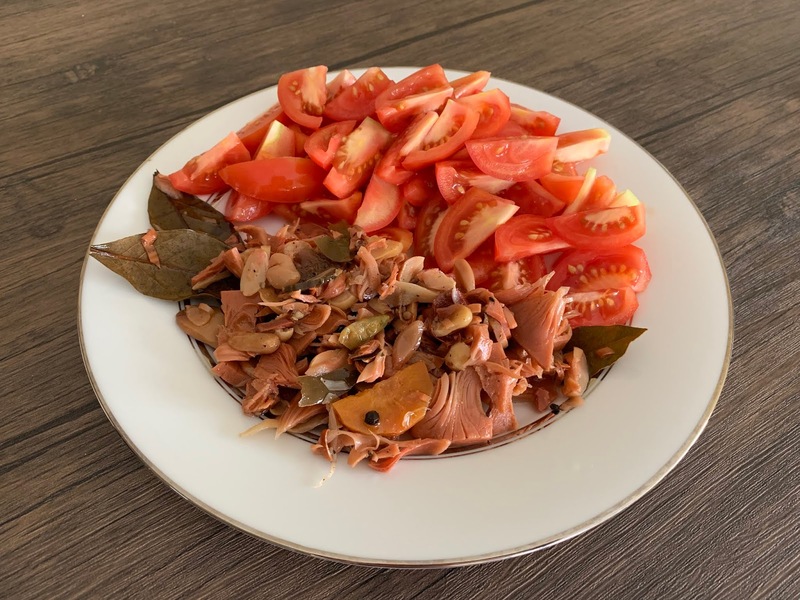 Personally I found my vegan grounding on health as I would not want to eventually get sick with chronic lifestyle diseases that has become a norm and be a financial and emotional liability to my children when that happens. So to prevent that from happening, I chose to go vegan for our family's health." When I asked her when she started making Jack's Produce, she answered, "Prior to us going vegan in 2016, Spanish-style sardines is my favorite, convenient comfort food. Having gone vegan, it meant giving that up because it has fish ingredients. 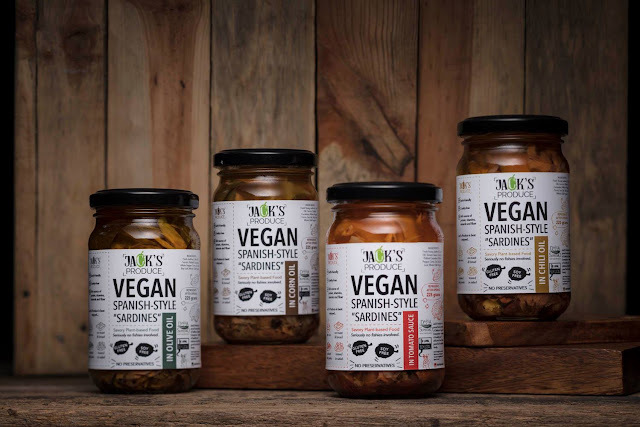 After almost a year of being vegan, the craving and longing for the Spanish-style sardines never left my mind that sometimes I felt that my EQ was being tested as to how long I can avoid it. 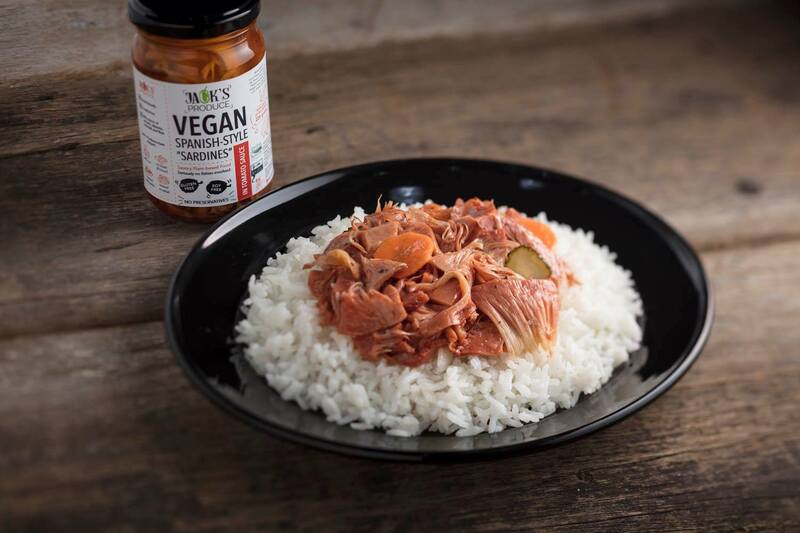 So to address that strong craving, in October 2017, I did my first attempt to make my first jar of the vegan Spanish-style "sardines" and used jackfruit to replace the fish ingredient. I cooked for several hours using the available kitchenwares I had, let it stand to cure and got to taste it with much anticipation the next morning. My heart was just very happy that day because finally I got to taste again my favorite Spanish-style "sardines". It was so good that I had to do it again and decided to make several extra jars so I can have my non-vegan connoisseur friends try it to get their feedback, but I didn't really hear back from them, so I thought that I can just share the remaining 2 jars I had to a couple of vegan friends who I thought might appreciate it better. To my delight, I got really positive feedback on it. It was timely too that Vegfest 2017 will be staged the following month. So we tapped an artist friend to design a label for us and thought hard on the brand name and Jack's Produce was born. 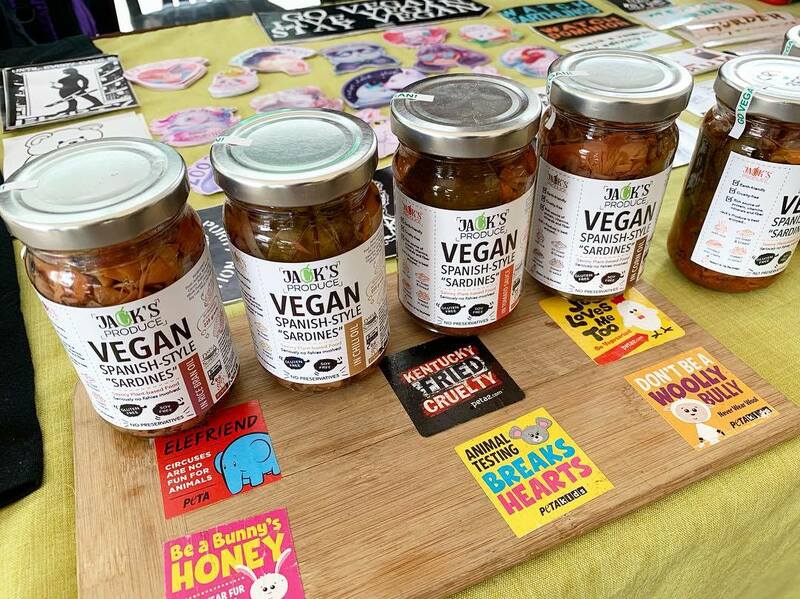 The Manila Vegans community was very welcoming of this new product and was so excited with us when we launched it and it was very well received at VegFest2017." When asked where people can buy their products, she responded, "Regularly, we are at Good Food Sunday Market at Mandala Park (Sundays 10am-5pm). It is also available at the following partner stores: NCR: Try Vegan-R.A Suarez Bldg, 363 El Grande Ave., BF Homes, Paranaque; The Vegan Grocer PH-201 C.M. Recto St., Addition Hills, San Juan; Earth Origins (Wilson St., ADB, Westgate Alabang), Real Food (Molito, Alabang and Icon Plaza, BGC); Greenery Kitchen (Kalayaan Ave., Makati), Ritual-Arnaiz Ave; Daily Feast (66 Broadway Ave., QC); Provincial Partner Stores: BATANES-Korner Hauz Cafe, Pangasinan-Tanaman Grocer, Tuguegarao-Toby's Vegan Grocer, Cebu-Vegan Shoppee; Davao-P Cafe, Phoenix Compound, Lanang, Davao City"
I always get the smaller jars because sometimes, it's only me who will eat for lunch so that way, it's just enough for me. You can choose from corn oil, olive oil, tomato sauce and chili oil. But, now, they also have rice bran oil.